Jackie, Healthy Witness: Health Journey, New Phase! Join me! Health Journey, New Phase! Join me! Last time I said that was October 2011 when I seriously changed my eating after a 24 hour sickness I thought was flu, parasite, or amoeba, but it ended up being "Candida"! After 24 hours of eating different, I was brand new! After that life decision, weight loss was a new life for me. I was eating (nor 'deprived') and losing weight monthly! After some months of things slowing down, I came across JJ Virgin online. Then, I wasn't just losing weight, I lost inches and sizes! Ring size from 9 to 7 and so on! 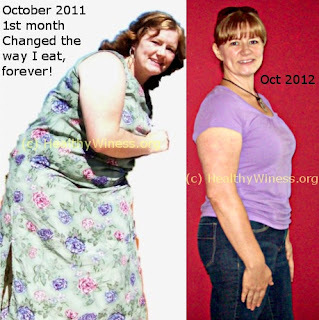 By October 2012, I had lost some 60+lbs by eating the "right stuff". Lately, I could tell I still need to take my health to the next level. After breakfast, without details, lets just say, I think I have an issue with eggs. This will be challenging, but I accept it for my Health's sake! Eggs are the last thing on The Virgin Diet that I have not eliminated, so it's time to do it! Are you with me? Do you want to eliminate 7 foods for 21 days and see how your body does? Get The Virgin Diet Book Kindle version and lets start December 1st! I am not too sure what I will eat for breakfast but I will eat and I won't starve. The results are what I look forward to! If you don't want to get the book, to get a start, I just downloaded The Virgin Diet Holiday Guide to help through the holidays. Do not "WAIT" until New Year's or after Christmas to be serious about your health. Lets Do This!!! If you want the full package and The Virgin Diet CHALLENGE then Click Here. It's a portion of the book that was edited out and offered separately! It even has a guarantee, so it's no risk and all that jargon. lol. I want to encourage you to start now and not wait for this date ot that date. If you make these 'deals' with yourself, then you are enabling yourself to make those deals later. It needs to be all or nothing to get the results you want... HEALTH!!!! Visit Healthy's profile on Pinterest. It's a progress, don't stop! Jackie Davis d.b.a. Healthy Witness (c) 2018. Simple theme. Powered by Blogger.